On Thursday 8 November, the Government of Taiwan commissioned two new warships bought from the US. During the ceremony, Taiwan reiterated its position of resisting Beijing’s threats to the island’s democracy. While the vessels were built in the 1980’s, the US Navy has maintained them accordingly and underneath their modest appearance they hide the latest technology, with a special focus to counter Beijing’s submarines. The vessels will actively patrol the Taiwan Strait. The sale of two U.S. warships to Taiwan, which were commissioned on Thursday, contributes to stability and military balance in Indo-Pacific region, the American Institute in Taiwan (AIT) said Thursday. President Tsai Ing-wen (蔡英文) commissioned the two U.S.-made Perry-class guided missile frigates at Zuoying Naval Base in Kaohsiung. Built in the 1980s and named USS Taylor and USS Gary in the U.S. Navy, the two vessels have been renamed in Taiwan as the Ming Chuan (銘傳) and Feng Chia (逢甲). They will be part of the Taiwan Navy's 146th fleet based in the outlying island of Penghu and will be deployed to patrol the Taiwan Strait, according to the Navy. In a press release Thursday, the AIT said the sale of the two Oliver Hazard Perry-class frigates was approved in December 2015 during the administration of then U.S. President Barack Obama. "This sale is consistent with United States commitments under the Taiwan Relations Act to provide military articles that support Taiwan's self-defense," said the AIT, which represents U.S. interests in Taiwan. 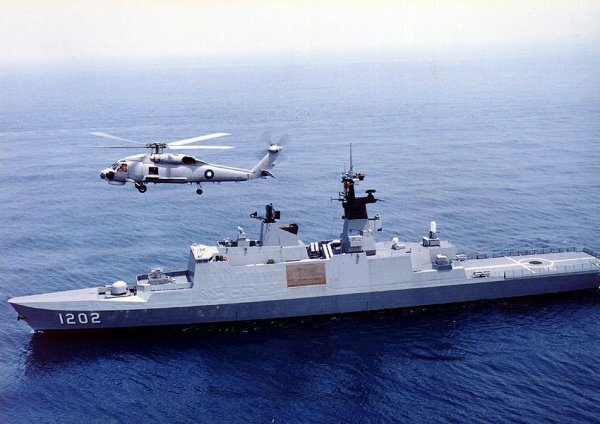 The two frigates "will improve Taiwan's capability in current and future defensive efforts, and furthers Taiwan's continuing work to modernize its armed forces," the AIT said. "Additionally, the transfer will contribute to political stability, military balance, and economic progress in the Indo-Pacific region, key elements of our Indo-Pacific Strategy," it added. The AIT also said it had sent representatives to Thursday's commissioning ceremony. "AIT Kaohsiung Chief Matt O'Conner and members of the AIT team participated in today's event to signify our enduring support to Taiwan's defense under the provisions of the Taiwan Relations Act of 1979," AIT spokesperson Amanda Mansour told CNA.